Well, almost. Yes, your eyes are not deceiving you, Siraj Gena is indeed barefoot as he crosses the line, however he didn't run the whole race barefoot, just the last 500m or so. 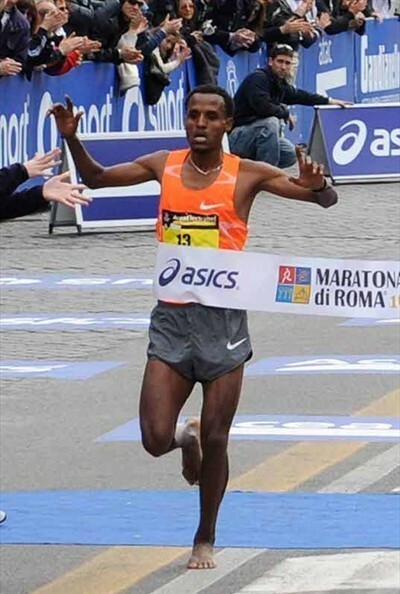 As a tribute to Abebe Bikila and to honour the 50th anniversary of his Olympic win in 1960 in Rome, the Rome Marathon offered a €5000 bonus to both the men's and women's winners today if they took off their shoes and socks and run the last 300m of the race barefoot. The winners would also get 20 seconds off their official finish time to compensate for the time lost to taking off their shoes. With the race in the bag by the 40th kilometer, Siraj fittingly paid his tribute and took off his shoes and pocketed a little extra cash.